As you read the article I posted earlier today about philanthropy, I encourage you to view this video and imagine how volunteers, staff, students in non-school tutor/mentor programs in poverty neighborhoods can bring this form of learning to youth who may never get this from the public or charter school in their neighborhood. This is from a MOOC that is just starting, titled "Making Learning Connected". I plan to join and I hope you'll encourage some of the people in your network to join as well. Charity Leaders Begin to Focus on Overhead Issue. More to do. If you have not noticed, some of the big charity leaders are beginning to focus on the "overhead" issue, or the way charities are rated based on the percent of money they pay on salaries, training, technology, learning, etc., which are the essential building blocks for strong organizations. Visit "The Overhead Myth" site to get engaged with this on a national basis, or this Donors Forum hosted site to connect on a Chicago level. I wonder how much of this is the result of the work Dan Pallota has done to put a spotlight on this issue? Dan gave a TED talk a few months ago that I wrote about here and here. 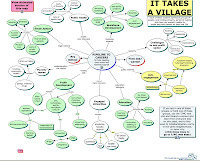 When I read Dan's book in 2011 I created a map to outline the chapters, recognizing that parts of the book, and parts of Dan's background, were pretty controversial. Let's focus on the parts we agree upon. In my own comments I've emphasized that networks of non-profits and social benefit organizations focusing on similar issues, such as youth in high poverty areas, could be forming communities of practice and innovating ways to build on-going, year-round communications campaigns that address some of the challenges Dan describes and that are described in these articles in the Tutor/Mentor Connection library. I keep using graphic like this one, and others which you can see on my Pinterest Boards, to illustrate quarterly events that can draw needed operating resources into tutor/mentor programs throughout Chicago. 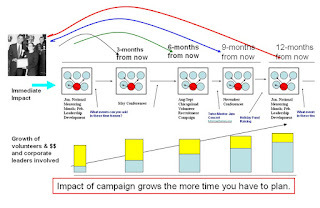 Such strategies can help programs attract talented people and keep them engaged for 5-, 10-years, or longer, so their knowledge, network and impact grows and they have more influence on the aspirations and habits of the kids who come through their programs, as well as the volunteers who provide time and talent. Talking about overhead without talking about the flow of resources needed to build strong organizations is not enough. Talking about this without using maps to talk about all the places where high quality programs are needed is not enough, either. This article may be read by one or two hundred people. That's not enough to change the way philanthropy and social benefit organizations are supported in Chicago, let alone in every city in the country. However, if you pass this story on to other people in your own network, more people will read it, and more people will find ways to integrate this thinking into their own discussions and actions. We are all part of networks. How we engage our networks in social problem solving, now and in the future, will determine what the world we leave to our children looks like. Read other articles with ideas like this at Mapping for Justice and Tutor/Mentor Intern blogs. In the June 19, 2013 issue of Chicago's REDEYE newspaper, the front page story was "Life & Death on E. 79th" which according to the paper has been one of Chicago's deadliest streets over the past 4 years. In the story was a map of the 2 block area, with an inset showing where this is in Chicago. Using the Chicago Tutor/Mentor Program Locator's interactive map platform I created a map of the East 79th Street area, adding poverty overlays and overlays showing poorly performing schools (from 2008) in the area as well as any volunteer-based, non-school tutor/mentor programs (based on what I have in my database). This map is shown on the left, below. I also created a map of the second neighborhood mentioned as "tied with East 79th Street" for the most homicides since Nov.2009. That was the 1300 Block of West Hastings. This map is shown on the right, below. In the two areas you can see different degrees of poverty, a few poorly performing schools, but almost no volunteer-based tutor/mentor programs. I created another map using the Chicago Health Atlas, to show the South Side of Chicago, and rate of homicides. As I write this some faith leaders are organizing marches in Chicago to draw attention to violence. 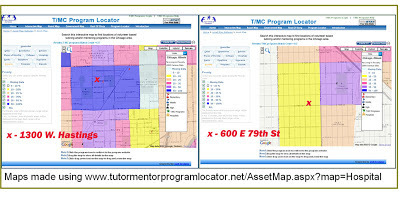 My goal is to show how they can use maps and the resources on the Tutor/Mentor Institute, LLC web site to do planning that mobilizes resources to build and sustain non-school youth tutoring, mentoring and learning resources in these neighborhoods. When we hosted the Tutor/Mentor Conference on June 7th, one of the speakers said "Think about it this way. Somebody will be there for the kids. If it isn’t the right somebody, there is a greater risk that those hooded guys on the corner also known as “the wrong somebody” will introduce them to the false courage or false bravado found behind guns and violence." Read the full transcript. During the conference I shared some slides showing the number of youth below the poverty line, age 6-17 , living in each Chicago Community Area. I encouraged participants, and I encourage people who read this article, to use the maps as a community mobilizing tool. 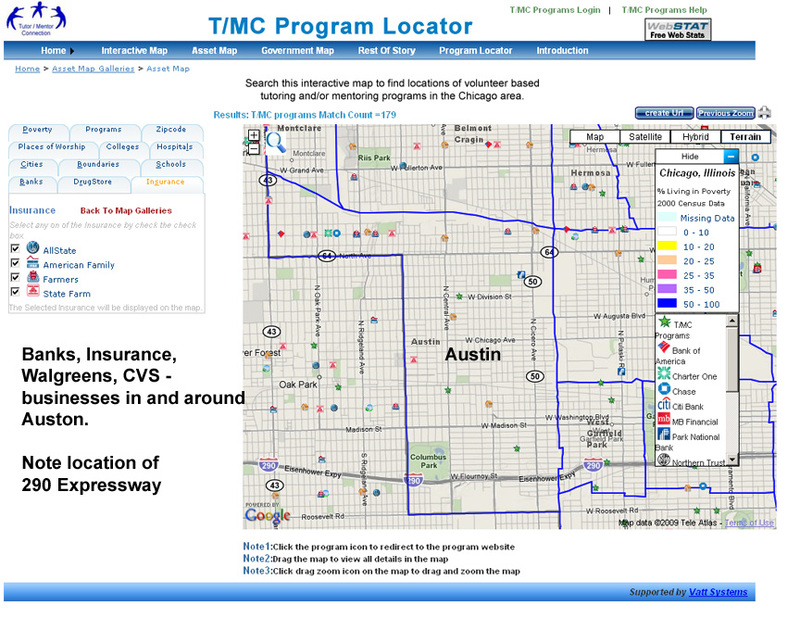 Using the Asset Map section of the program locator you can create a map image like the one at the left, showing assets in the neighborhood, such as businesses, faith groups, hospitals and universities. These groups share the issues of the neighborhood because they are part of it! They should be part of on-going meetings aimed at building and sustaining a wide range of mentor-rich non-school youth tutoring, mentoring, learning, jobs and career prep programs. The maps also show transit routes through the neighborhood, enabling workers from the suburbs to "drive by" poverty areas of the city. 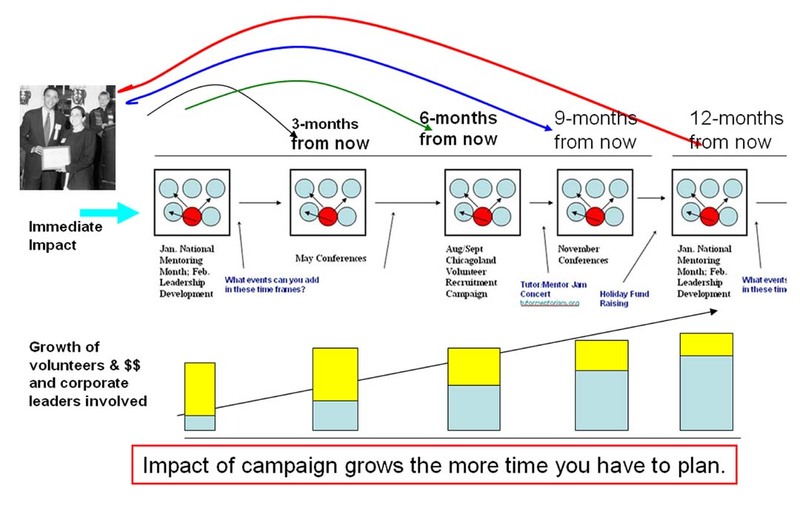 Marketing campaigns should attempt to engage these people as volunteers, donors, leaders, organizers rather than just readers of sensationalist stories in the local media. 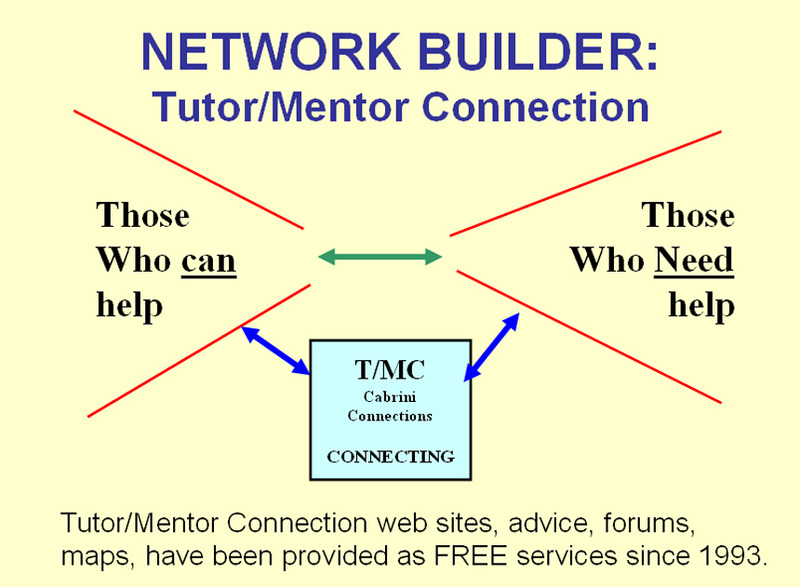 If adults don't have time to try to understand the ideas on the Tutor/Mentor Institute, LLC site, why not enlist young people from their school, faith group or non profit to do this work. Here's a project that interprets ideas on the Tutor/Mentor Institute, LLC web site, done by an intern working with me in Chicago. Young people in many places could be doing the research and learning that adults don't have time to do. 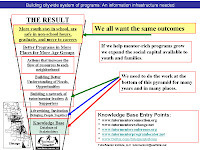 When the media do stories showing where poverty takes place there should be bye-lines pointing to places where readers can connect with information and with community organizing efforts that lead to strategies that build and sustain programs that compete for young people's attention and participation and help them better prepare to succeed in school and life. When faith leaders do sermons connecting scripture and service, or when the do marches to protest violence, they should also point to web libraries and information like this, so more people get involved in supporting the growth of youth organizations in more places. Tutor/Mentor Institute, LLC can help you organize these meetings and learn to use the Program Locator and other resources on our web sites. Just ask for our involvement. Visit other sections of this web site, our blogs and our Facebook page to find more information and get connected. 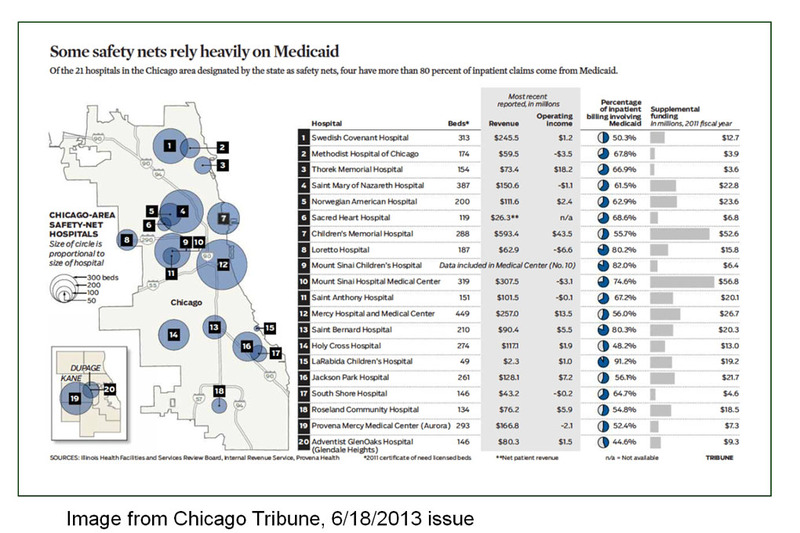 The map below was included in a June 19 Chicago Tribune article titled "Chicago Safety-Net Hospitals Face Uncertain Future" The article talks about how the "high costs of poverty" are putting tremendous financial pressures on inner city hospitals. I've written about this in the past in this set of articles. I've also pointed to other articles showing challenges of hospitals, which are posted in this section of the Tutor/Mentor Connection library. 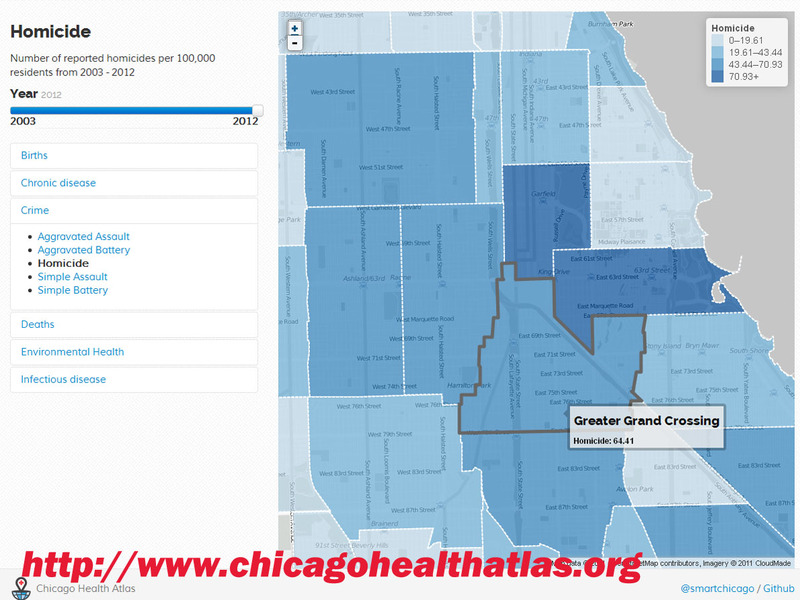 This Chicago Health Atlas is a tremendous resource for understanding the distribution of public health issues throughout the region. I've even shared a "strategic plan" that any hospital could adopt to lower its costs of poverty as well as its cost of attracting skilled workers. This document is designed to be used as a planning tool that leaders in hospitals and teaching universities can use to build their own strategic plan. It is available on Scribd.com for a small fee. 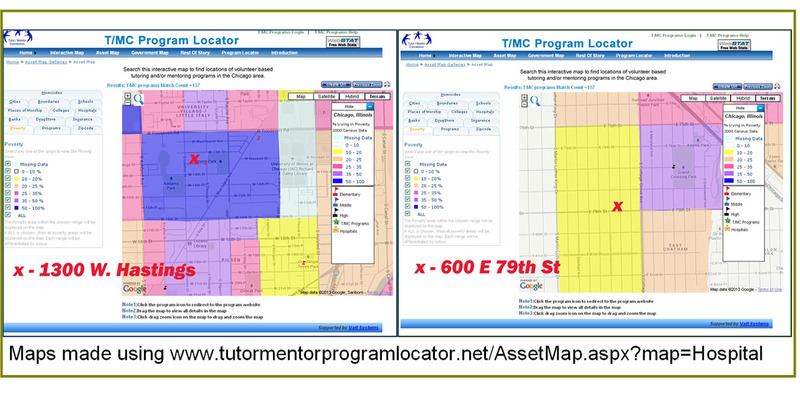 In this section of the Tutor/Mentor Program Locator you can build maps that zoom into the neighborhood around each Chicago hospital, showing levels of poverty, locations of poorly performing schools, and non-school tutor/mentor programs that are in the database. 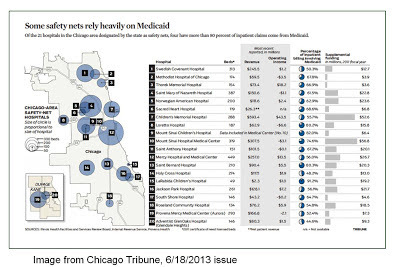 The circles on the Chicago Tribune map illustrate how each hospital could be an anchor institution in its neighborhood, bringing people together, organizing collective efforts, and mobilizing support for the growth of a wide range of "birth to work" programs supporting youth in the area. Such programs can include mentors from the hospital who model health careers and teach youth and other volunteers about healthy lifestyles. As these messages are adopted the hospital lowers the costs of poverty at the emergency room and inspires young people to think of careers in health care professions. If you'd like to have my help in exploring these ideas, just connect with me on Facebook, Twitter or Linked in. 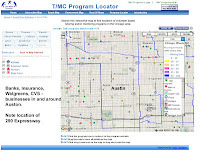 Read more articles about using maps. "Don't Ride By Poverty. Get involved." The map below shows participants in the most recent Tutor/Mentor Leadership and Networking Conference, held in Chicago on June 7. Total attendance was 103-105 with multiple participants from a few organizations such as Ada S. McKinley Community Services, The Black Star Project, Chicago Cares, Ball State University, etc. You can see some of the registered attendees on the conference attendee list. From looking at the map you can see that while most participants were from the Chicago region some came from other parts of Illinois and other states. You can see previous maps like this on this page. If you've read about Collective Impact on the Stanford Social Innovation Review web site you understand the role of intermediaries, or "backbone organizations" in bringing together a wide range of organizations in a geographic region and in focusing them on a common shared purpose. 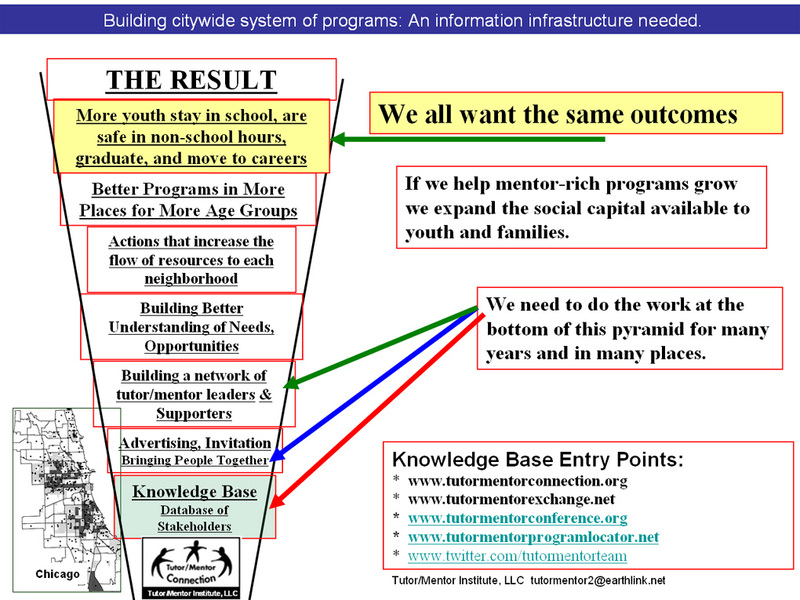 I've used graphics like this in PDFs like this to illustrate my own long-term efforts of bringing people in Chicago together to support the growth of mentor-rich programs in high poverty neighborhoods. I've also shared graphics like this to illustrate the range of people I think need to be connected and working collectively. 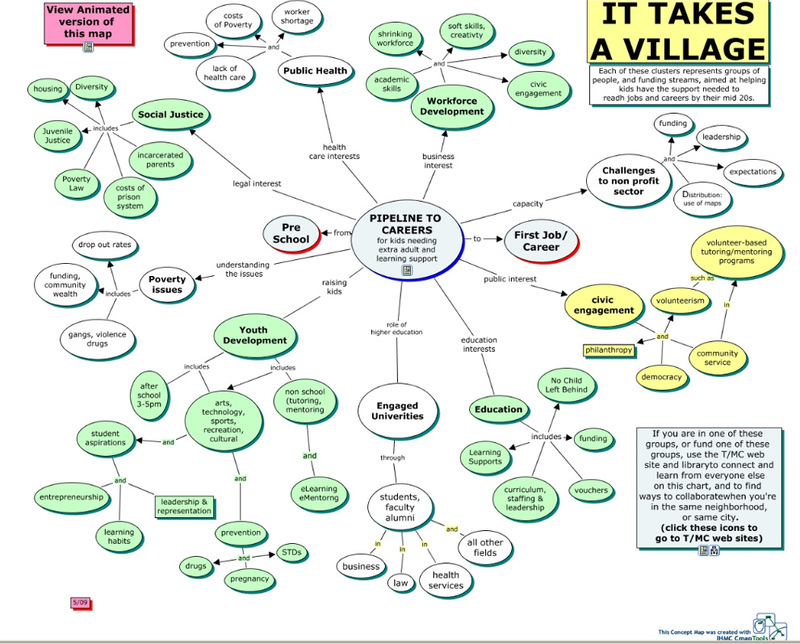 This concept map shows intermediary organizations focused on the well-being of youth who I invite to participate in the conferences that I've hosted since May 1994. When you look at the conference maps I've done you quickly can see that there are few representatives from business, philanthropy, media, politics, religion and other networks working with youth. This could be because I have so few resources to reach out an invite them to attend or because they are hosting their own events and don't see value in participating in the Tutor/Mentor Conferences. This graphic illustrates the need to connect people in on-going networking, relationship building and learning so that groups begin to build a shared understanding of common goals, challenges of meeting those goals, and ways to work collectively to overcome those challenges. The process of building these databases and inviting people to gather is on-going. The maps can show how well we are doing. 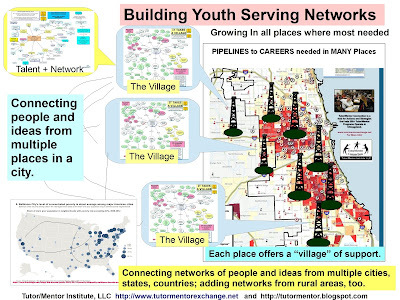 If others are doing similar work I encourage them to share maps showing participation in their events and graphics showing the goal and strategies that they believe will result in more support for k-12 youth in more of the high poverty neighborhoods of Chicago. If others are not doing this then I invite you to provide the resources needed for me to expand the invitations to the conference and maintain the information libraries that we can all draw from in supporting our various actions intended to help keep youth in school and prepare youth for jobs and careers. With your help, the next conference which will be November 4th, and future conference maps will show a broader range of participants and blogs and other documentation systems will show actions many are taking to use their time, talent and dollars in strategic and on-going efforts that reach youth in more places and stay connected to youth for more years. "Happy Fathers Day to my long time friend and tutor, Daniel F. Bassill. It's been over 40 years and I appreciate what you've done for me over all of those years. Thank you forever." We've stayed connected for this long because I've stayed involved in the tutoring program for that long. In the articles on this blog and the Tutor/Mentor Institute, LLC site my goal is to help mentoring/tutoring organizations build the structure and leadership that enables many volunteers to build and sustain life-long connections that benefit both the youth and the adults, as well as everyone who support such programs. While we held a Tutor/Mentor Conference last week in Chicago to share ideas, expand networks, and celebrate the work done over the past year, the goal is that we begin to focus efforts on activities that will help recruit more volunteers to support tutor/mentor programs throughout the Chicago region (and other cities) as school starts in August/September and that we will work to help those volunteers grow their involvement over the following 9 months. 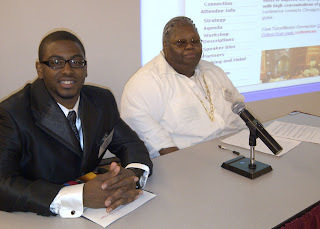 During the June 7 conference Maxine Williams and Samuel Carter, a coordinator and mentee from the FunDay School in Chicago told their story to the conference participants. In the audience were Sam's Father, and Sam's Mentor, who was given recognition by Sam for all the ways he had helped Sam get through school and into college. You can read Maxine's comments here. Every three months there is can be an event and activity that supports the growth of tutor/mentor programs in more places throughout Chicago. Every day there is a library of information and ideas that volunteers, students, leaders, donors and policy makers can look at to find more ways they can be proactive in supporting these programs. Every Father's Day there ought to be thousands of young people giving messages of thanks like Leo has given me and that Sam gave to his mentor at the last conference. We need leaders from many sectors to support the events and the different tutor/mentor programs in their communities. If you are one of those leaders and want to connect with me and the Tutor/Mentor Institute, just introduce yourself on Facebook, Linked in, or Twitter, or join my forum on Ning. I've written often about network building and network analysis. In many articles I've demonstrated uses of maps to show networks in many different ways. This slide share shows the value of networks and tools for network analysis. If you appreciate this and are interested in building networks of business, non profits, faith groups, community, etc. 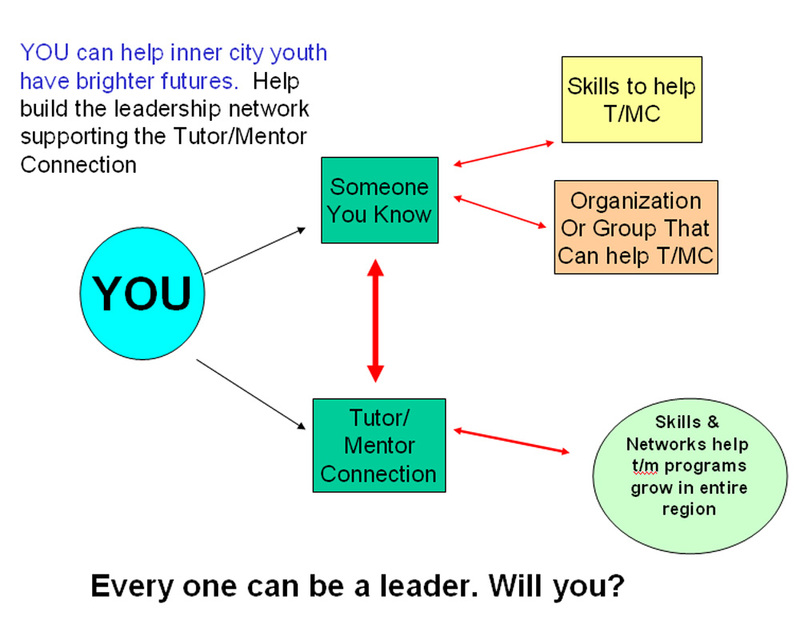 to help inner city kids, contact me and offer your help with the Tutor/Mentor Connection and Tutor/Mentor Institute, LLC. As you review this presentation I also encourage you to look at this Stanford Social Innovation Review article titled Stop Funding Duplicative Projects It demonstrates the value of building knowledge libraries such as I've amassed on the Tutor/Mentor Institute, LLC web site. Collecting information and building networks are two parts of an on-going problem solving process that needs formal and on-going support in Chicago and other communities. Do you agree? Can we connect? Here's a video sent by my friends in the Webheads community, showing a talk show with one student interviewing another. This type of work could be done in any tutor/mentor program, to draw attention to the work the program does, draw resources to the program and teach communications and technology skills to students. If you're doing this type of programming please post a link to where you share these videos. Last Friday more than 100 people attended the Tutor/Mentor Leadership and Networking Conference held at the Ralph E. Metcalfe Federal Building in Chicago. During the opening remarks Maxine Williams, who was coordinator of the FunDay School in Chicago and Samuel Carter, who attended from 4th grade through high school gradation, were speakers. Maxine's story can be found here, showing that the program was featured on a 48 Hours episode about violence in Chicago, and that the program no longer is operating, although she's still connected to young people like Samuel. Following the conference, one of the other workshop speakers, Daniel Cotter, chair of the Lawyers Lend A Hand to Youth Program, emailed me with this message: "I hope the session was useful and of interest to the attendees. Sam seemed like a great young man! We need more help as we have discussed in the arena to make sure we have thousands of Sams." During my noon presentation I showed a set of maps like this one. 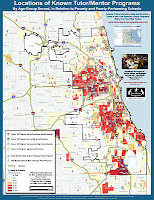 Each showed the number of high poverty youth, age 6-17, living in each Chicago community area. The presentation is here. 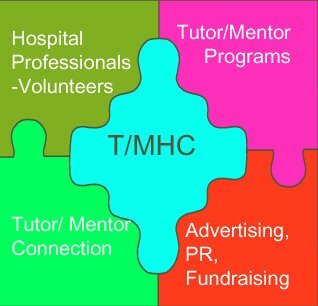 My goal is that people in each community area will use this information, and the other information on the Tutor/Mentor Institute, LLC web site, to gather leaders of business, faith groups, hospitals, education organizations, non profits, media, government, etc. into an on-going set of meetings intended to increase the resources available to support the growth of mentor-rich non-school tutoring, mentoring, arts, technology and college and career preparation programs in EACH community area. It's not enough to have a few great programs in a few places. Chicago and its suburbs needs great tutor/mentor programs serving k-12 youth in every high poverty neighborhood. I've had interns from various colleges work with me off and on for the past 15 years. In addition, volunteers in the Cabrini Connections program that I led from 1992 to 2011 organized a video club, where teens learned to create videos. I've focused some of this work on communicating some of the ideas I originated in blogs and other formats, using video, Prezi or PowerPoint, flash animation, etc. I have two new interns with me, who started on May 22. This is a video created by Kyngryul Kim. You can see more work done by interns on this page. I've written often about the challenges small non profits have in attracting the talent and dollars they need to keep kids and volunteers connected. Imagine how much more effective they could be if the there were students and volunteers in high schools, colleges, faith groups and other tutor/mentor programs creating their own versions of these presentations, pointing to their own city if they are not in Chicago. 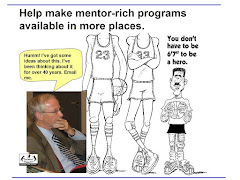 Are you a Mentor? Share this with kids you work with. A role of mentors is to expand the possibilities and aspirations of young people they connect with. Thus, as you move toward the 2013-14 school year, here's a video I encourage you to share with kids you work with. This is something I've been writing about since 2007 when I posted this article. If leaders in manufacturing would take a strategic role with the Tutor/Mentor Connection they could be encouraging people who work in the industry to support tutor/mentor programs throughout the region, so more kids begin to see the many opportunities in this industry as they rise through elementary and middle school. Thank you David DeWitt of Manufacturing Stories for sending me this video.